As it's put together with needle and thread I was well within my comfort zone on this one. Having attempted some earrings which involved manipulating metal I can confirm that definitely needs more practice, but it's certainly ignited my interest in jewellery-making. As there are lots more workshops on offer, this seems a great way to try some different things. I've noticed a LOT of cross-stitch amongst fellow "knitters" lately so how about you? Do you have plans for learning new crafts? As you know I was on a jewellery workshop last weekend and it was great definitely doing the next one which is corded jewellery so I imagine there will be a lot of knots involved dib dib dib! I make Stained Glass as you know from the star in your Cwtch but I often cut my fingers all those plasters play havoc with my knitting! I enjoy the occasional cross stitch, although I am slow and laborious at it! 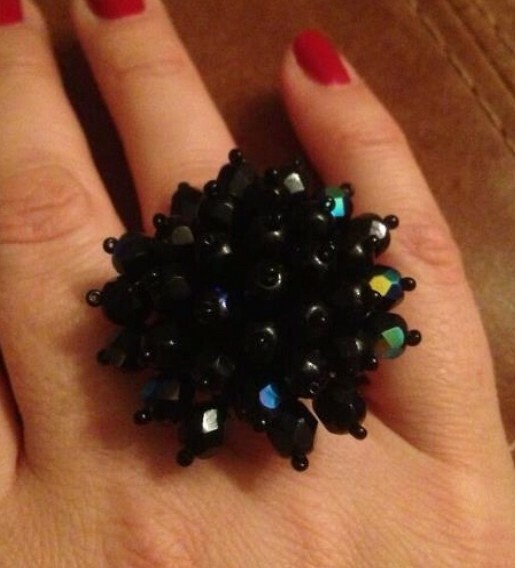 Ohhhh lovely ring and its fun stepping out of our comfort zones and trying new crafts. Me I'm a cross stitcher, I can't remember which I learned first as a child as my childhood was full of both, I suspect its knitting as my Mom is a great knitter. This year crochet is my "new" thing. I know the basic stitches and I was determined this year to try and improve my crochet skills. Lovely! I really like big chunky rings, really stylish. I might try some cross-stitching like many other knitters, it is indeed fun to explore some new crafts! I have all the skills I want, or have time for LOL, right now. But I do want to perfect weaving, may even be looking at a cricket loom next week. If I had the eyesight for tiny bead holes, I would love to pursue more jewelry making, but it's not a burning desire. Love the ring! Gorgeous! I've been looking at jewelry making too. I have a lot of seed beads that might be good for some crochet rope necklaces and bracelets. And the other day I watched a tutorial on Viking Knit metalwork bracelets. Looks amazing and I can't wait to try it! This ring is super smart. I always have plans for new crafts. In the past two weeks I've started making lace with bobbins as freestyle embroidery - I've always been into cross-stitch but wanted to get better at general needlework! I love this ring, you're going to love wearing it.